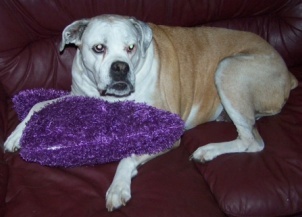 Today our sweet girl Piper passed over the Rainbowbridge.It was a snowy Velentines day in 2004 that she came to us. Piper had come our way by Lonestar Boxer in Houston. There was no rescue in Austin at that time. Karen and I made several trips from Austin to get Bosco a mate. He picked her out! How lucky we were. Piper was very ill with HW at the time and did not even know if she was gonna survive. We brought her back to Austin and nursed her back to health. In the weeks that followed she became Karen’s shadow and walking partner, she did this everyday for 8 years until her heart began giving out. The Drs told us she could go at anytime, but with a lot of love and GREAT VET care (Emergency Clinic) in Round Rock! Piper took a ride with her Brother Boone and Sister Willow everyday in the Jeep and an occasional stroll with Mom. We did not know that ride yesterday would be our last. All that knew her will miss her deeply. She did things her own way and time. Baby girl you gave us happiness everyday of your life, you will be missed but never forgotten. I know it was your time, and you will always be part of us. I know by know you have found your Sister Brindi and Brothers Bosco and the Major. You have been made whole again with no pain and lots of bones ,grass and new smells. We will meet again on the other side and start a new adventure that will never end. RIP our sweet Angel, you are loved more than you will ever know.